Honda Civics have a firm grip on the reliability prize. Being a vehicle that has been on the market for more then 30 years it has continually held top marks for the vehicle with fewer problems than any other in its class. Honda Civics have had their issues but have always had them resolved quickly and efficiently through recalls, service bulletins to the dealers and extended warranties. Aside from any shortcomings, the Civic has improved continually from its humble beginnings. A rust prone underpowered yet very reliable fuel miser of the early 70's to become a well rounded and well respected vehicle with sporty acceleration, agile handling and outstanding fuel economy for the new millennium. 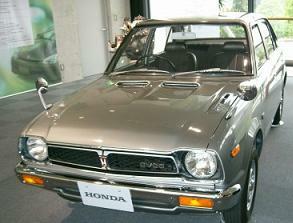 The Civic has maintained near same fuel economy since it was first launched in July 1972. Through its 30 year history some complaints have surfaced and Honda has responded with various corrective measures. Check out 2009 reviews to compliment this page. Early models were quite rust prone. If you are contemplating purchasing a Civic older than 1996 be sure to have it carefully examined by a professional. Both the engine and transmission will most likely continue to operate for some time, if it was properly maintained but the suspension, fuel tank and body attachment points may not survive the ride. Since the 1996 redesign body integrity issues have subsided substantially. Head gasket failures on non-VTEC motors were a noticed complaint until the 2000 model year. 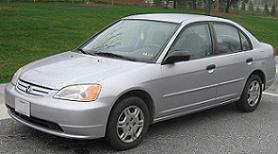 We have a more complete list of common problems for the 2001-2009 Honda Civics. -The front rotors warping and causing a vibration when braking. The rotors need machining. -Certain manual transmissions have a clicking noise when turning from the reverse gear contacting other gears. The transmission needs new updated gears installed to stop the noise. -Automatic transmission has excessive second clutch wear. Transmission replacement needed if this occurs. -The front struts leak causing the vehicle to have poor handling. Replacing will correct the problem. -A worn bushing on rear lower control arm cause noises when going over rougher terrain. Replacing the bushing stop the noise. -Powertrain Control Module (PCM) incorrectly reads coolant temperature and turns the Check Engine light on. Dealer needs to install updated software. -Check engine light coming on from variable vlve timing valve and two way by pass valve. Replacing the valves needed to correct problem. -Plugged moon roof drains cause a water leak when turning a corner. Cleaning the drains corrects problem. -Sunroof squeaking can occur. Anti squeak tape needed to correct noise. -Drivers seat bushings can wear causing the seat to rock. Replacing the bushings needed correct excess movement in seat. - Drive belt tension noise can be heard on the interior. A new updated belt from Honda and rerouting the belt is needed. -Some automatic transmission models performing a cold start and at higher altitudes make the brake pedal feel hard. The power brake booster needs replacing and updating the Powertrain Control Module software is needed to correct. -Warping of rotors can cause vibration to be felt through steering wheel. Machining will correct this problem. -Powertrain Control Module misreads info from coolant sensor and turns Check Engine light on. A software update from Honda will correct. -Engine RPM does not drop after starting and can make car lurch in first gear. A software update corrects. -Power Control Module and Air Fuel Sensor can incorrectly cause Check Engine Light to come on. Software update will correct. -Rear wheel bearings wearing out prematurely. Replacing needed to correct this issue. -Airbag light (SRS) may come on from a defective position sensor. Replacing through the Honda Civic recalls will correct. -Some models door glass will come out of it's track. Door glass needs to be replaced to correct. -Plugged moonroof drains cause a water leaks when turning a corner. Clearing the drains correct. -Squeaks or rattles from near rear glass. Resealing may correct this problem.